Consistencey, service, food & flavours are the ingredients that Guy & Celine Graham lovingly serve up at the Pukeko Junction Cafe & Deli at Leithfield. This recipe has once again brought them success. Guy & Celine for the third year in a row, are celebrating receiving the Trip Advisor Certificate of Excellence, an achievement for earning great traveller reviews on Trip Advisor over the past year.Guy & Celine say the award is special because the reviews of Pukeko Junction are unsolicited and independent and being awarded it three times in a row shows Pukeko Junction is providing a consistently good experience. “It’s all about consistency. We are always aiming at a high level of consistency” says Guy. They also credit their staff, and a team spirit, for helping keep the consistency, energy and enthusiasm that is very evident in the busy cafe. There are 18 staff, some of them part timers but they are all a part of a “big team that is really great”. “A lot of Rangiora High School students started doing clean up. We have had 3 stay on at a job they started as 14 year olds. One is now restaurant manager and another is full time in the kitchen. It is really special for us”. say Celine & Guy. “You see them come is petrified and then they grow and before long they are on the till and welcoming patrons. It is one of the most satisfying parts of the place, bringing up the younger, future work force who put so much into helping build up the business,” says Guy. The couple have been in the business at Pukeko Junction for eight years, buying it in 2008. They brought with them an ethos that has served them well. “We look relaxed but we have got a high standard of service and food. We dont like things being too stuffy. It can be really crazy in here. “Our doors are open to everyone and our pricing shows that and we are known for our generous portions with big salads. We cater for everyone from guys working on the roads to the ladys wanting a flash lunch and a nice wine,” says Guy. 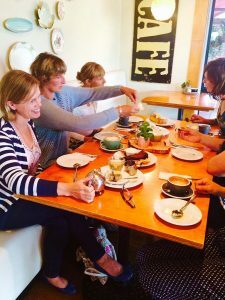 The cafe is the first stop on the way to Kaikoura and Hanmer Springs for many and they are benefiting from an increase in traffic passing the state highway cafe and deli. Last year due to the workload at the seven day a week business, the couple decided to put Pukeko Junction on the market. “Then, when we got a buyeer, we didn’t want to sell anymore,” Celine & Guy said. They also won Cafe of the Year run by the Restaurant Association of New Zealand which gave them an added incentive to carry on. So they decided to make the business more manageable and close on Mondays to give themselves with their young family and avoid the burn out they were experiencing. “We decided if we worked smarter we would be able to continue. We love it here. We love North Canterbury and all the things that are happening here. We are proud to be a part of that. The locals are fantastic and we love the characters in this part of the world.” Patrons can now look forward to hearty winter fare joining the menu as Pukeko Junction hunkers down for the cooler climes.